Graced by our new, delicate lotus paintings, handpainted with utmost care by our dedicated artisans, our new lotus ceramics collection imbues the home with a truly timeless, Vietnamese beauty—standing as perfect additions to our White Stone collection. It is rather quite impossible not to love a white glaze ceramic vase with brown floral patterns from the Ly Dynasty period. From the 11th to 16th centuries, as in the Ly and Tran dynasties, the Vietnamese ceramic craft has created a unique and truly beautiful aesthetic foundation.The bottom of a ceramic piece from the Ly Dynasty often left a space unglazed, to be left as is or painted with brown ink, and so in holding it, our hands are still able to touch the very earth from whence it came. While Chinese aesthetics found sophistication in the polishing and refinement of their art, the ceramics of the Vietnamese people, while elegant, nevertheless always retained their natural and everyday friendliness, much akin to the spirit of Buddhist meditation. 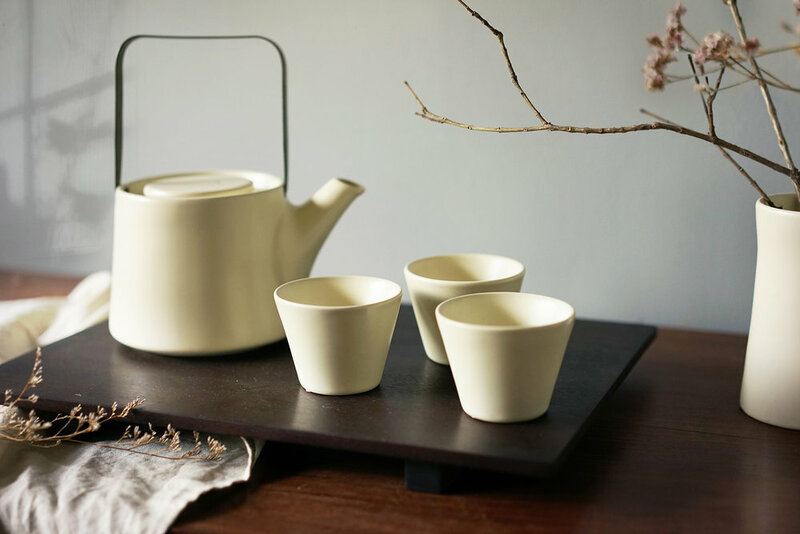 We loved the white glazes of the Ly Dynasty, and from its inspiration and foundation, have always wished to develop it into a perfect, yet natural White Stone glaze. The Cam Ha workshop at the time had already become one of the most masterful and capable ceramics worshops of the country, and it is thus that we dared to begin uncovering our own path toward this very ambitious dream. Today, after 15 years of research since our dream began,—and we can still not quite believe it—we are now, for the first time, holding our dream ceramic piece with a perfected white stone glaze in our hands. It is perfect, yet not industrial, retaining the intimate and friendly beauty of an item that is, piece by piece, passionately handcrafted by the most diligent and persevering human hands. Our new ceramics, with their slightly off-white colour, are as smooth as if they were meticulously moulded and sharpened from the velvety white pebbles of nature. With a simple and humble beauty, a white stone glaze ceramic piece has nothing extravagant to flaunt to its observer; and yet, you can not imagine a material more precious and beautiful for you to hold in your hands and on which to place the tastiest and most aesthetically pleasing foods for it to hold in its grace and timeless beauty. For you to truly see and feel the beauty of the White Stone glaze, for its very first production, we are introducing a line of products without our usual paintings on them, with elegant forms meticulously designed and selected; in truly classical fashion, meaning it simply cannot be made any better than this in terms of function and aesthetics; and finally, imbued with a creative essence true to the meditative spirit of the Ly dynasty that we so adore. District 1, Ho Chi Minh City, Vietnam.